One of the most basic men’s accessories is the necktie, but have you ever really wondered where they came from and why they are a staple in men’s wear? Neckties originated in the 17th century when Croatian mercenaries hired by King Louis XIII wore colored fabric around their necks. This led way to the creation of the pre-modern neckties. Worn as a symbol of honor towards the Croatian people. Tie’s became mandatory for meetings and royal gatherings for the next 400 years. Although the styles have changed through the ages, neckties have stayed basically the same for the past 100 years. 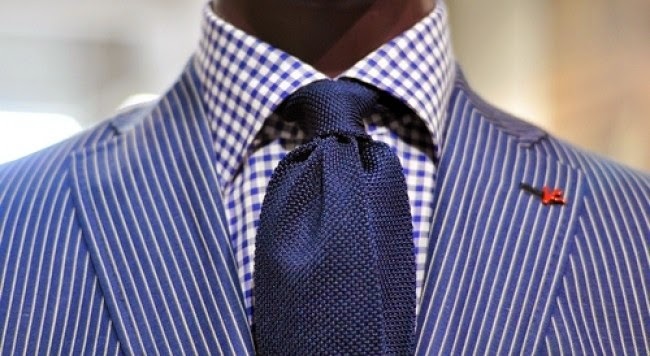 During the 1930’s and the Art Deco movement, ties became more elaborate and wide. Ties were made with lots of fabric folded intricately 7 to 11 times. Creating a heavier tie that laid flat, and created an distinguished knot. At the beginning of World War II, fabric was rationed, and ties were made with the least amount of fabric possible, creating the standard necktie that we know and love today. Tie width took a decline in the 50’s with the creation of the skinny tie to accommodate and accentuate the form fitting and heavily tailored suits men were wearing. The following 40 years held no regard to consistency. You could find skinny ties, as well as ties reaching 6 inches wide! With the trend of menswear going away from ties, we are defiantly pushing against that! PULL THOSE TIES BACK OUT! Men don’t get a lot of accessories, and ties are a great way to add a little extra to your outfit.